Sometimes, you’ve just gotta have fried chicken. 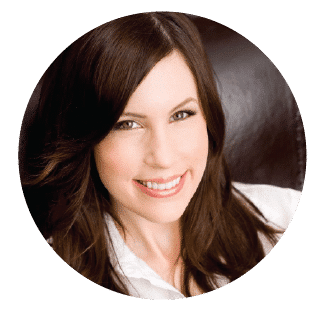 For me, the mood strikes when the it’s overcast and cold outside– I call it “comfort food weather.” The trouble with fried chicken is the fat… and cholesterol… and all of that grease. As yummy as it tastes, our waistlines don’t love it. “A minute on the lips, forever on the hips,” as they say! Too much grease gives me a tummy ache; it’s like my body saying, “what the heck were you thinking? ?” Also, a lot of fried chicken recipes contain buttermilk. It makes for a terrific, flavorful coating, but it can’t be enjoyed by folks who keep kosher. So the other night, I was craving fried chicken, but I most definitely wasn’t craving the calories (or the tummy ache). I decided to experiment and come up with my own healthier version– an “unfried” chicken, if you will. There are lots of recipes out there for unfried or oven fried chicken, but I’ve never really found one I like. 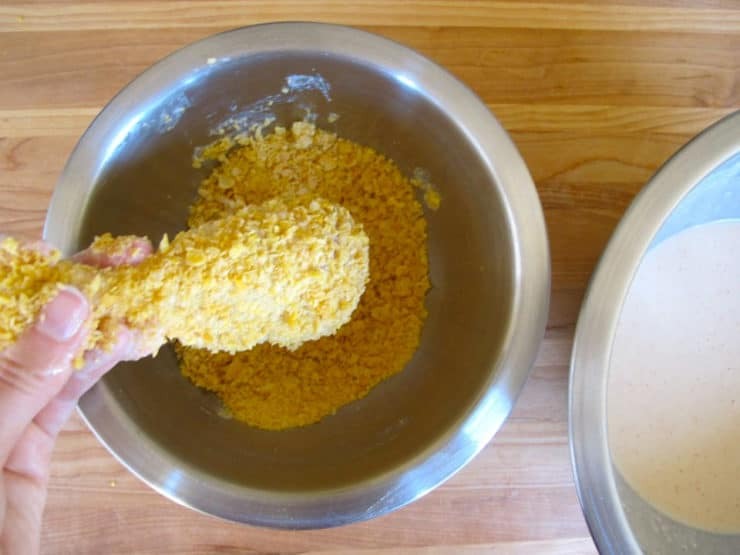 Most use oil or egg to bind breadcrumbs or cornflakes directly to the chicken, which results in a kind of wimpy coating. I wanted something more like batter-fried chicken, with the crispiness of frying without oil. I already knew cornflakes would be a great way to get that crunchy texture. I decided to try a seasoned tempura-style batter, which I hoped would bake up thick and crispy beneath the cornflakes. After testing and varying the recipe multiple times, I finally nailed it. Success! This chicken is SO good, with no fatty skin and hardly any oil at all– the batter holds in the moisture, and the coating is every bit as crunchy as the fried stuff. My husband said he likes it even better than the fried version, because there is no guilt involved. I also tested a gluten free modification for my GF readers, and it rocked too! I love it when that happens. A few tips: use dark meat on the bone, not white– a breast will turn out kind of dry because you need to cook it a long time. Plus, the dark meat has more natural flavor to it. I’ve offered two liquid options for the batter, seltzer or ginger ale. I used ginger ale one night on a whim, and it adds a really nice flavor to the coating. The ginger ale gives a light sweetness to the batter, almost imperceptible in the finished product– it just adds a little extra “something.” Use seltzer instead of ginger ale if you’re watching your sugar intake. Don’t be afraid to let the chicken cook a little longer than you think it needs. The batter is somewhat thick, and you want to make sure it cooks all the way through. For the coating, I like Erewhon Organic Corn Flakes, which are simply made with corn and salt (they’re also gluten free and kosher certified). Any cornflakes will do, as long as they’re not overly sweetened (make sure they’re kosher certified if you’re keeping kosher). Finally, don’t forget that extra sprinkle of salt and pepper at the end of cooking– it’s the perfect way to “finish” the dish. I like serving this Oven Fried Crispy Cornflake Chicken with green beans (try my Green Bean Pepper Salad) and mashed potatoes, along with a side of hot sauce or sriracha. It’s a cozy, filling meal without the guilt. How awesome is that? Healthy, egg free, dairy free, guilt free fried chicken. Gluten free option. 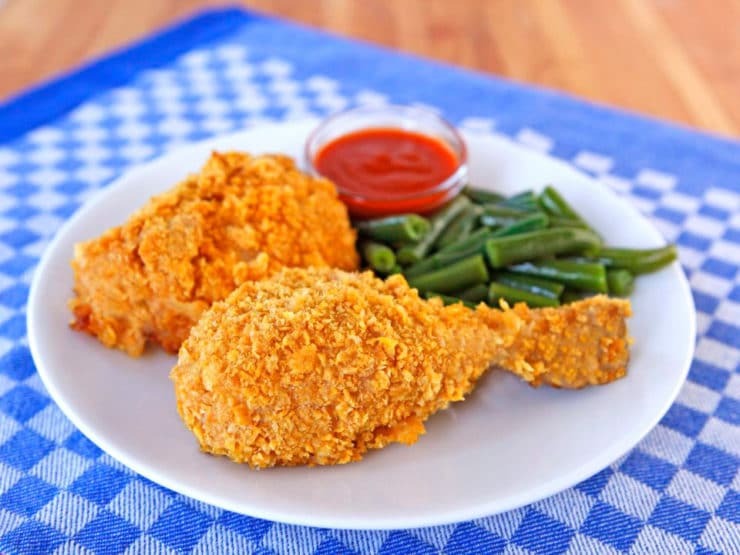 Crunchy baked skinless chicken, batter with cornflake crust. Kosher. Note: If you’re keeping kosher, make sure your cornflakes are other packaged products are dairy free (pareve). 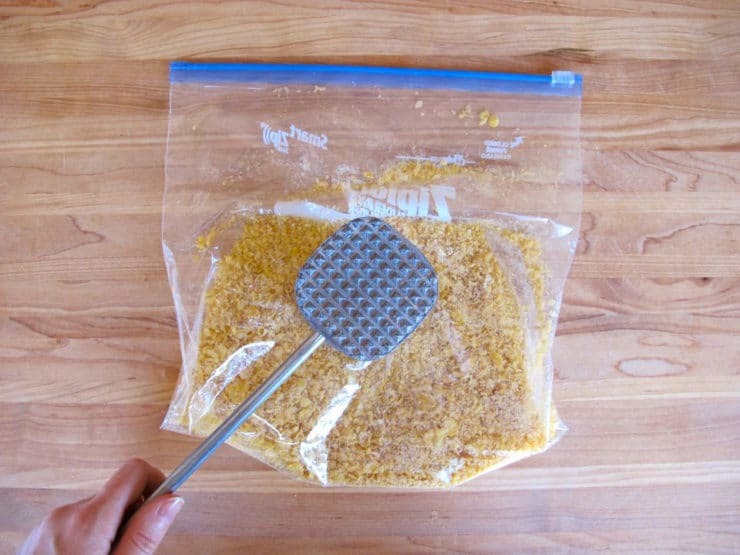 Preheat oven to 400 degrees F. Pour the cornflakes into a plastic zipper bag. Use a mallet or the back of a large metal spoon to pound and crush the cornflakes into smaller pieces. Reserve. In a medium mixing bowl whisk together the seltzer or ginger ale, flour, cornstarch, 1 tsp salt, garlic powder, and cayenne pepper till smooth. The batter will bubble at first, then settle. Pour the crushed cornflakes into another bowl. Keep an empty plate handy for the chicken. 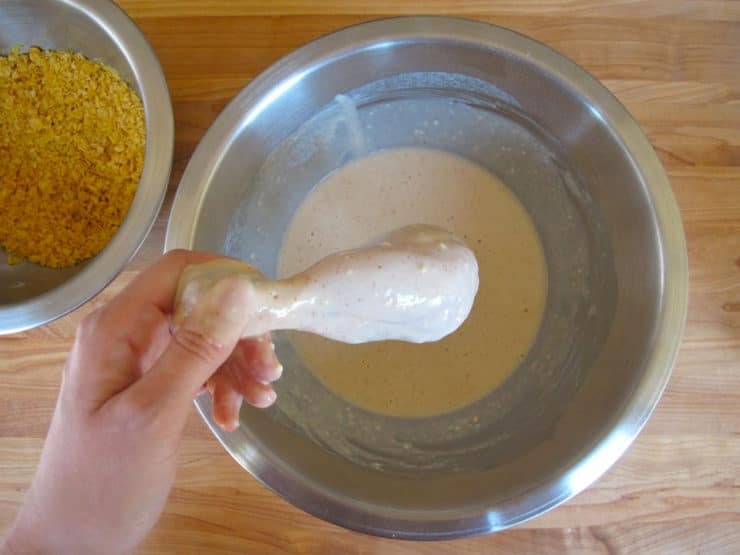 Working one piece at a time, dip the chicken into the batter. 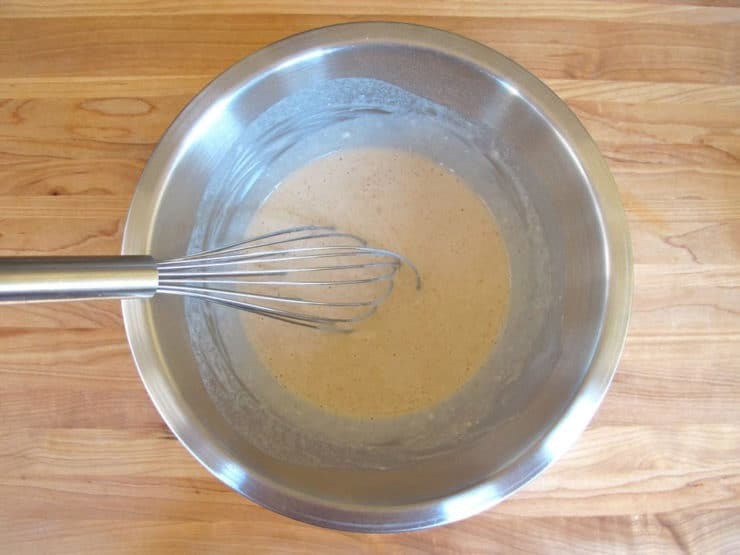 When you pull the chicken out of the batter, let any excess batter drip back into the bowl. Gently roll in crushed cornflakes to coat. Place the cornflake coated chicken onto the empty plate. Repeat for remaining chicken pieces. Spray a baking sheet generously with nonstick cooking oil spray. Place chicken pieces onto the sheet, evenly spaced. Spray the tops of the chicken pieces with a light, even layer of cooking oil spray. Place chicken into the middle rack of the oven (not the top!) and bake for 45-55 minutes till golden brown, crispy and cooked through. The batter coating is thick; it will take a while to cook through and become completely crisp. Err on the side of cooking it longer if you’re unsure of doneness—letting it cook a few more minutes won’t hurt, the coating locks moisture into the meat. The chicken will be dark in places- this is good! Sprinkle chicken with salt and pepper to taste. Serve hot directly from the oven; like any fried or "unfried" chicken, the coating will lose its crispness over time. I like serving it with a side of Louisiana hot sauce or sriracha. I’m in the process of trying this but was wondering, do you turn the chicken over at the half way point on the time? Thanks so much! No need to turn. Enjoy! This looks amazing, I do wonder if you must use ginger ale or seltzer water for the batter. HI Tori! 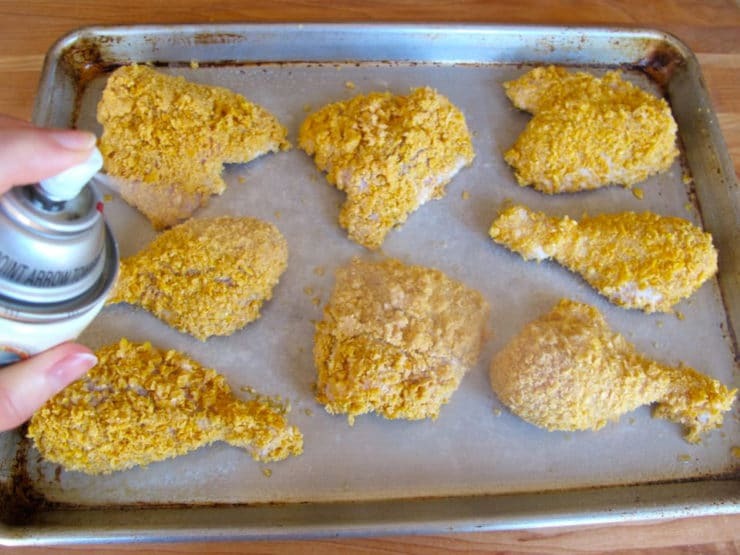 I love your recipes and tried the cornflake chicken for a Chanukah party I had last night. I used drumsticks only. It was a great hit with both the adults and kids! What could be better than “fried” chicken and latkes? Many thanks! Hi Eddie, try a cornflake brand from the health food/organic food aisle. These tend to be unsweetened or only mildly sweetened. A little sweetness in this coating actually would work fine, but I agree it’s best to avoid anything overly-sugary. How would I make this with boneless tenders? I do not recommend this recipe with boneless tenders, the batter is too thick for them. And how do they reheat if made a day in advance ? They’ll be a lot less crunchy and crispy, and they’ll lose a lot of their appeal. This is not a great make ahead dish, unfortunately. If you are game to try it, reheat it in the oven to help the coating crisp up a bit… but know that it won’t be nearly as good as it is when made fresh. Can you freeze these chicken pieces? Can they be made a day in advance if not and reheated for shabbat? Hi Gabrielle– because of the delicate nature of the coating on this chicken, I would not recommend freezing. I tried this recipe for the first time tonight and it was a big hit. However, I did not have any cornflakes so improvised with panko . I was worried that the panko would not crisp and brown but it did ! I also decided to drizzle a little honey on the chicken pieces once they had been dipped and coated in panko and after I had sprayed some low fat oil. The honey created lovely dark caramelised streaks and I think added an extra touch to this great recipe. I am vegetarian so I couldn’t sample the end result but my family loved this dish. It was simple yet effective – my perfect recipe. Great to know Shelley-Anne! When I tried with panko it failed to turn golden, but perhaps it was the variety of panko I was using. At any rate I’m so happy you enjoyed the recipe! it for pure flavorful quality. And the ginger ale is the Vernon brand from Cleveland, Ohio. The tastiest ginger ale in the world. It was Sammy Davis, Jr. favorite with Americas Rye. Well, my dear Tori, I say thank you for making my celebration of the Super Bowl Sunday au complete. and vitamin values of it. Polish dishes in days ahead. Thank you for this ‘sharing experience’. This was amazing;thank you so much !!! My family devoured the crispy skin – delicious! I made this chicken Friday night and it is absolutely amazing. I’ve tried many oven fried chicken recipes before but this one is the winner! The crust is so crispy (I did cook it extra time, as you suggested) that it’s hard to believe it isn’t fried. The meat is tender, moist and beautifully seasoned. I did reheat the leftovers slightly in the oven today – not bad, but much better when freshly made. Thanks! My dear friend who keeps Kosher 100% shared with me that SOY MILK-plain–can be used in place of cows milk for “dipping and/or soaking overnight”…..Also, ALWAYS use a meat thermometer–Using one has changed my culinary life! 165* is the temp that poultry is cooked—-Thats why also, it is important to “pound” the meat so that the thickness is even AND thereby cooking evenly! Now enjoy and Ess Gazinta Heit,Y’ll!!!! m.a. As a kosher gf girl, I thank you from the bottom of my heart for a treat I KNOW my whole family will enjoy. You’re a credit to the tribe, gal-keep cooking-you rock! Would it be possible to make a “beer batter” version by adding the same amount of beer instead of ginger ale? What about using panko instead of cornflakes, would that work? And one less question (promise): could this batter be used for frying fish in a pan, or would it have to be adapted somehow? Love you blog, btw! Just like my momma used to make! Totally for got about making chicken this way. She used to use potato chips sometimes too! It was always about using everything up, no waste! We made this for Shabbat. It was excellent! We made this tonight and it was a big hit! We have egg allergies here so were super excited to find a “breaded” chicken recipe without any eggs. I was wondering if you’ve tried the batter & cornflake crumbs on pieces of boneless chicken to create either “nuggets” or “chicken fingers”? My kids prefer that to bone-in chicken. Hi Lynn, so happy you enjoyed this recipe. And yes! A boneless breast modification of this recipe is going into my upcoming cookbook. 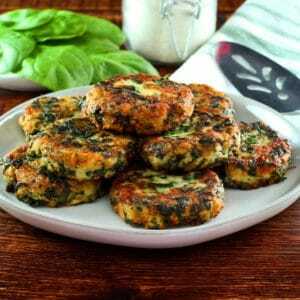 It is tweaked a bit– as written, the batter is too thick for boneless meat, which cooks much faster. Stay tuned! This looks delicious! I love crispy chicken and especially with a cornflake topping. I’ll be trying this sometime soon. Thanks for the recipe. Thank you for your recipes Tori. Could I use the Panko-style crisps to replace the Cornflakes? I like the sound of the crispiness remaining after cooking. Hi Paula, you think like I do! I tested panko breadcrumbs too, thinking they’d be a great alternative, but unfortunately they just don’t work for oven frying. For some reason the panko doesn’t bake up brown and crisp– it stays light beige in color, and doesn’t become crispy the way it does when you fry it. I tried it without success. The cornflakes work great, though! Tori, that is my go to chicken dish(with a little modification)! 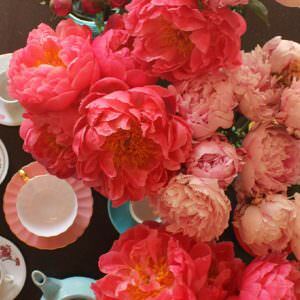 My kids love it and it is their number one request when they come home. We dip ours in bleu cheese dressing and serve it(mandatory) with a baked potato and gushy(canned) string beans. What a great substitute for fried chicken. And I love the dark meat best anyway. I can’t wait to try this. Thanks for persevering and finding a solution that’s tasty. Sounds like an interesting idea Ellen. My kosher readers wouldn’t be able to try it, but those who are not kosher might enjoy your variation. Thanks for sharing!